At Gardens Galore we can create a bespoke design for your project and work with you and your ideas helping you to visualise your dream garden. We have many years of experience with garden design and we can create a garden that you can enjoy for many years to come. Not every garden design involves a complicated scale drawing. Sometimes simply marking the area of a deck or patio with chalk paint in a sunny corner is all that is required to design a seating and entertaining area. In other instances, a sketch incorporating a few well thought out ideas can help to visualise the best use of space. Sometimes a Computer Aided Design (CAD) will be beneficial to show layout of features and materials. For larger, more complicated projects, a full scaled drawing may be required, possibly incorporating a planting plan. In every instance though, we will listen carefully to your thoughts and needs, and we will offer our own advice and ideas as required. Style – modern and contemporary or more traditional. Family requirements – is garden to be child friendly or an adult entertaining space. Materials – to compliment property or for ease of aftercare. Maintenance – is low maintenance required, artificial or real grass. Site conditions – is drainage an issue, is site level. There is a vast choice of materials on the market allowing you create a variety of looks and feels. So, whether it’s modern artificial lawn, contemporary decking or more traditional paving, there is something for every taste and budget. 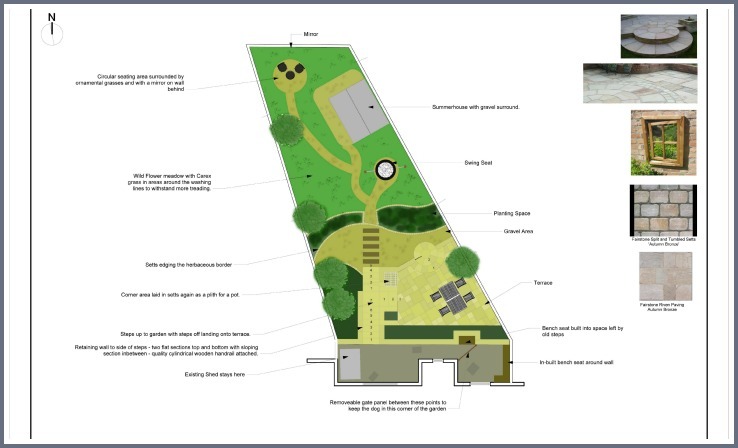 Not only can we help to design your garden but we can then create the design using our team of specialists and professionals, providing you with the complete garden design and build package. "From planning and design, the choice of materials and the execution of the work through to completion we have been fascinated to watch the job progressing and think that it all looks stunning. Please pass on our sincere thanks to all the team." For a little inspiration why not check out Our Garden Services and have a browse through Our Garden Projects.